I am a digital woman, entrepreneur and most importantly, a mother. I am always on-the-go and since the majority of my work is online, I always have to be connected. That means, always being able to have a charged phone and connectivity. So, my purse consists of the normal paraphernalia but, always contains a USB cord and portable charger. While I admit, lugging around a long cord in my purse can be a bit annoying, it is necessary. I’m very minimalist and prefer things that are small, sleek and easy to use when it comes to technology. It can almost likely be the smallest and most portable USB cable to charge your devices. 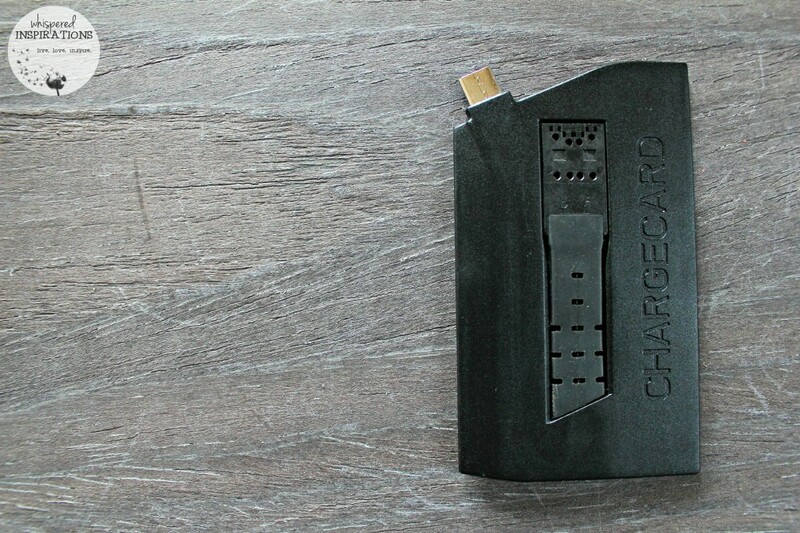 When I was asked to review both the ChargeKey and ChargeCard, I was stoked. I chose the ChargeKey for my iPhone and boy, the size is pretty much the size of, well, a key! 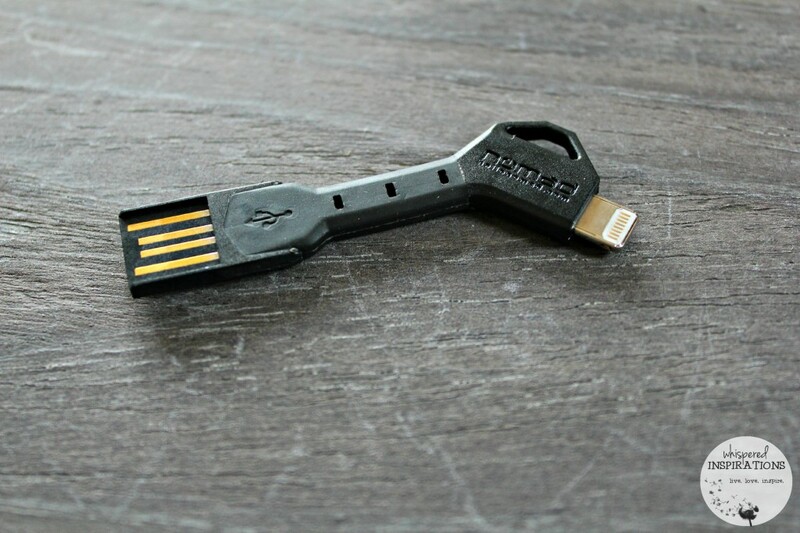 It allows for charging from any USB port (works just like your standard iPhone 5 cable) and full data transfer when connected to a computer. 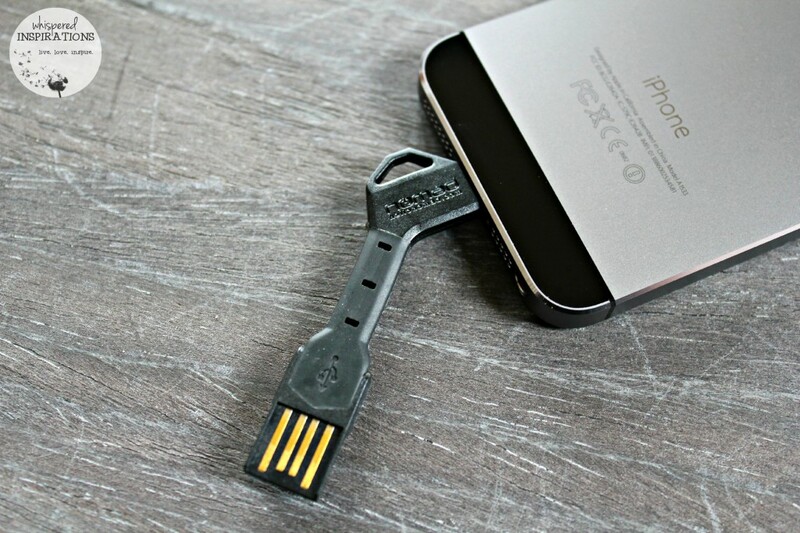 The NOMAD ChargeKey has eliminated the need for me to carry around a full cord in my purse. Now, I can just use my favorite portable charger, attach my Chargekey to it and then click it into my phone. BOOM. It’s charging as I do my errands and no long, coiled up cord getting stuck or wrapped around my wallet. It is a total godsend and since I travel a lot, this little thing can fit in my cord wrap or just in the pouch of my portable charger. Easy, peasy. 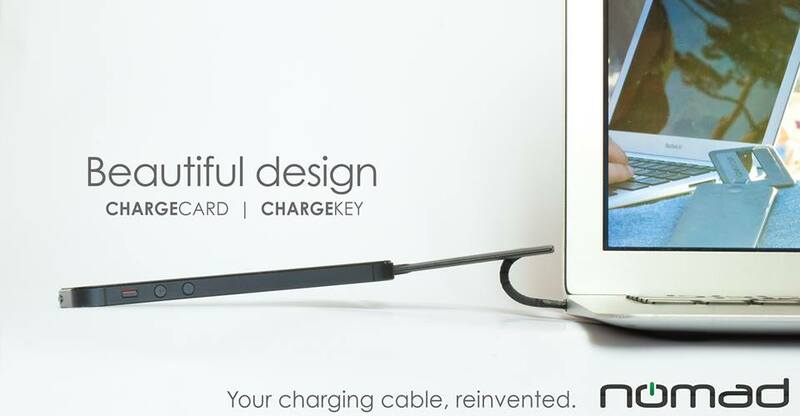 Who Wants a Cord That Fits Into Your Wallet? 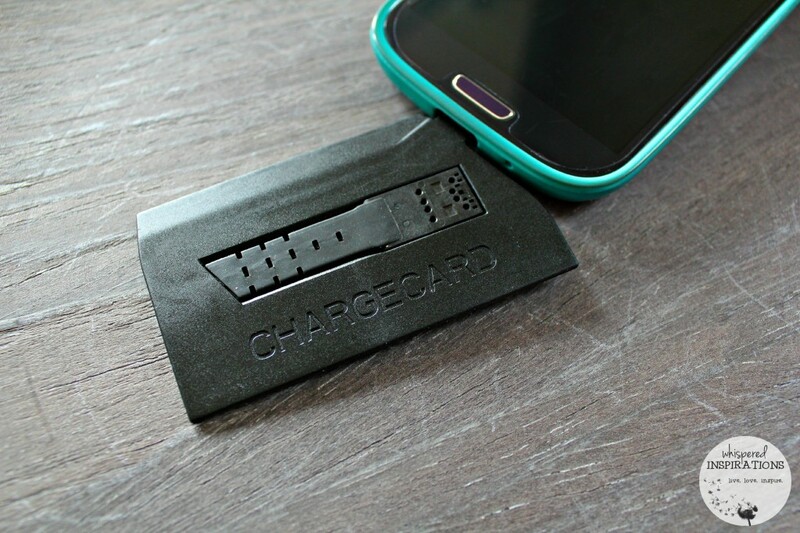 Well, the ChargeCard from Nomad is such a cool product. 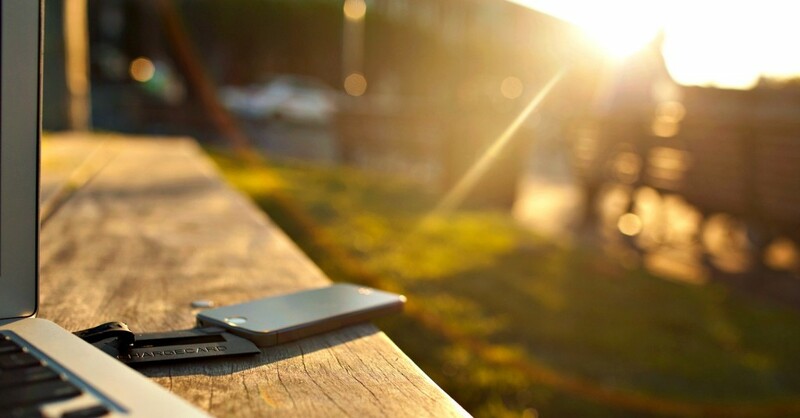 It looks like a credit card but, it can charge your Android device from any USB port. My husband especially loved this because he can now charge his phone or tablet and doesn’t have to carry around a cord. He literally put it in his wallet and he was good to go. Slipped it in and it is ready for the next time he needs to charge or transfer files. I love how NOMAD has made it possible to have convenient and minimalistic products that are made for the modern nomad. 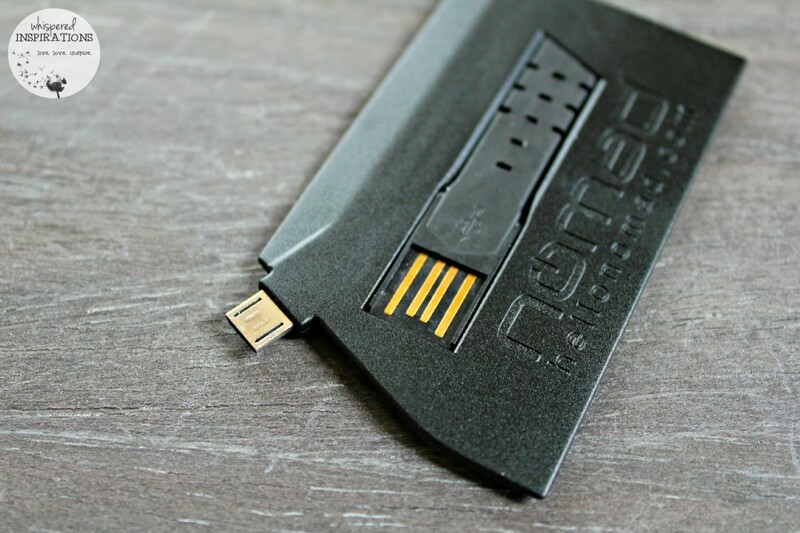 These products were launched on Kickstarter (ChargeCard) and Indiegogo (ChargeKey) and exceeded their goal by 300%. That alone tells me that they have a winning product, one that consumers believe in. My bleeding geeky and techie heart flutters with gadgets like this and I proudly use them because they work well and fit my lifestyle. So, when I am out doing errands with the kids, I am charging my phone in my purse. Or when my husband is on the computer and wants to transfer a file, he just reaches into his wallet. All with the ease of not having to lug around a charge cord. The ChargeKey and the ChargeCard retail for $29.00 which is an amazing price for the ease and portability that it offers. You can get 20% off if you purchase one through Whispered Inspirations! I sure am and I highly recommend getting one of these. If you are a digital man or woman and love your gadgets, you will love these. You can get more information by going to hellonomad.com and you can definitely connect with @nomadgoods on Twitter and like them on Facebook, here. 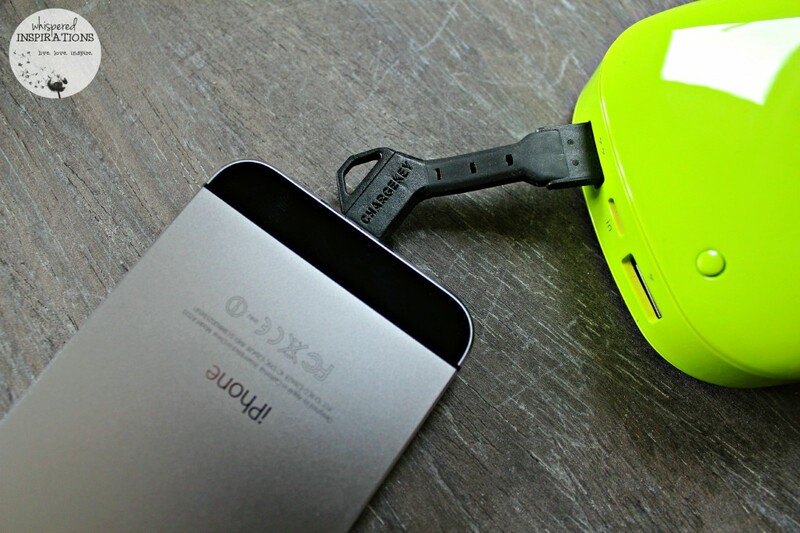 How do you charge your devices on the go? Let me know, til then-cheers m’deres! I am loving the sleek design of this. What a handy gadget to have! This is awesome! I have been carrying a full sized charging cord around and it gets tangled up in everything. This would be so much better. Me too, no more though! Well that is definitely handy. Cords can be so messy! That is extremely cool! My phone is always dying on me at the most important moment! Oh now, you need this! This looks like a pretty cool gadget. I bet my husband would really like this. This gadget sounds awesome. I so want one! You should, so great for travel and on the go. That looks so cool. I want one because I'm sick of cords tangled around our house. That will do the trick, eliminate them! This device is awesome and exactly what I need for travel too!! THOSE are cool. i hate toting cords around!! not fun! Me too, not fun at all. Wow, that portable charger is so sleek and thin! I could even throw that into my wristlet if I don't want to carry a purse! Now that's a great gadget!! Every blogger needs something like this for sure! Love how small it is! now that is a cool tech toy! it would definitely come in handy for me! I have to recharge my phone around 3pm every day, so having a chargekey like this would definitely same me some hassle with chords! I really like that. I have to look into one. I always need a charge. That is so awesome!!! I want one! I know exactly what you mean about the cords being everywhere. It's beyond annoying to constantly be untangling everything. I love this so much!! I must admit that I get frustrated when I'm getting something out of my purse/bag, and out with it comes my charging cord which is entangled around it!